The swift pace of growth being observed in the global aviation sector has proved to be a vital driving force for the overall aerospace floor panels market. Owing to a marked increase in the affordability of air travel, rising disposable incomes, and drastic lifestyle changes, a sizeable portion of the global population now opts for air transportation – a factor that has sky-rocketed the air passenger traffic. In fact, as per the statistics released by International Air Transport Association (IATA), the worldwide air passenger traffic is anticipated to surpass a humongous figure of 4.3 billion in 2018 which amounts to a decent growth rate of 6 percent when compared to last year. 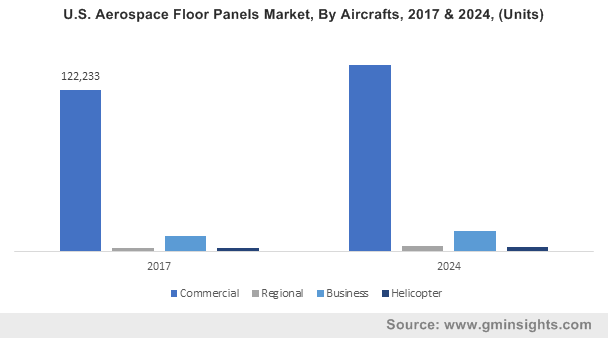 In addition to this, a robust regulatory framework and improved sustainability of the aviation sector has further fueled the commercialization scale of aerospace floor panels industry. In order to comply with various code of conducts and guidelines prescribed by prominent regulatory authorities such as International Civil Aviation Organization (ICAO) and Federal Aviation Administration (FAA), the demand for lightweight aircrafts equipped with aesthetically superior interior systems has witnessed remarkable uptick across the aviation sector. Leading aircraft manufacturers such as Airbus, Boeing, and Bombardier have focused on increasing their production capacities in the recent times. As per reliable estimates, the worldwide fleet of commercial aircraft in 2017 stood at 31,000 which is a 4 percent increase than the previous year. This momentous surge in the aircraft fleet has been the result of an increased level of aircraft production which has, in turn, impelled the growth prospects of aerospace floor panels market. In fact, as per a research assessment undertaken by Global Market Insights, Inc., the commercial aircraft segment is estimated to apportion over 86 percent of the total revenue share of the aerospace floor panels industry by 2024. The Washington-based Aviation Technical Services (ATS) for instance, has recently announced to have teamed up with Aerospace Machining and Assembly Inc. (AMAI) to build, market, and deliver a set of cargo bay protection solutions. The set, which includes Anchor Guards, Side Wall Protectors, and Cargo Pit Liner, would provide numerous advantages for narrow-body aircraft operators and reduce aircraft gate delays. Particularly, the Side Wall Protectors and Cargo Pit Liners would prevent damaging fluids from entering the cargo pit sub-structure and safeguard the pit floor from dents and scratches. Apparently, the collaboration sets a new benchmark in developing a new suite of products that is likely to have an optimistic impact on the aerospace floor panels market space. Regarded as one of the foremost companies partaking in aerospace floor panels industry, Rockwell Collins, has inked a five-year agreement with Switzerland based aviation services provider, Comlux. According to the terms of the deal, Rockwell Collins would provide a wide range product portfolio including cabin management, avionics, seating, entertainment options, and ARINCDirectSM connectivity for the premium customers of Comlux. Additionally, the engineering work on the first two aircrafts have been commenced and the partnership aims to achieve optimum operational balance without compromising on the level of elegance and design of aircraft cabins. Owing to the massive expansion of military and commercial aviation sectors coupled with the presence of renowned aircraft manufacturers like Boeing, Falcon, Airbus, and Lockheed Martin, the North America aerospace floor panels market is estimated to register a CAGR of 2.2 percent over the estimated time frame. While North America is deemed to be a key contributor, other geographies like Europe and APAC would play a crucial role in propelling the revenue share of this industry. Driven by a commendable spurt in air passenger traffic and the subsequent demand for lightweight aircrafts, the remuneration portfolio of aerospace floor panels industry is projected to exceed USD 230 million by the end of 2024.